Will Virginia Vote to Deregulate Cosmetology ? 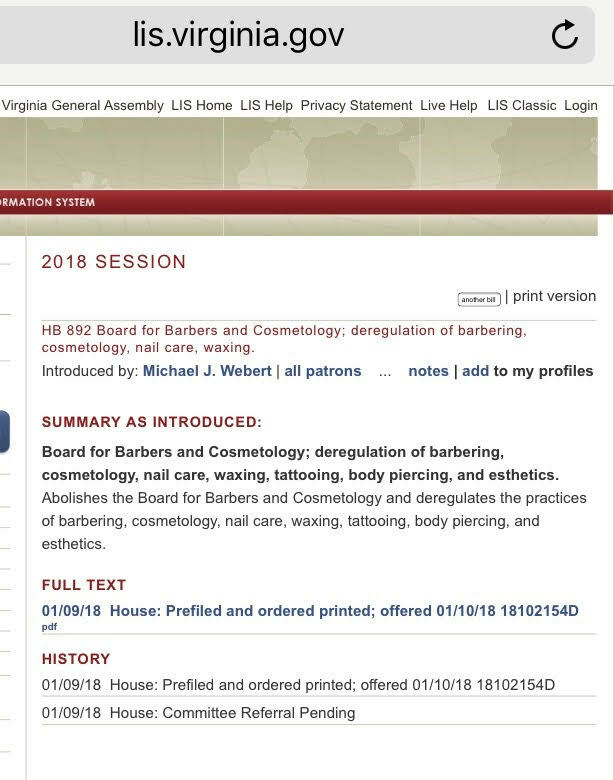 HB 892 Board for Barbers and Cosmetology; deregulation of barbering, cosmetology, nail care, waxing. Introduced by: Michael J. Webert. Board for Barbers and Cosmetology; deregulation of barbering, cosmetology, nail care, waxing, tattooing, body piercing, and esthetics. Abolishes the Board for Barbers and Cosmetology and deregulates the practices of barbering, cosmetology, nail care, waxing, tattooing, body piercing, and esthetics.